When the sun comes out, you want to be thinking about heading to the beach or enjoying a picnic with your friends – not worrying about whether you’re going to make it. Seeing as the great British summer weather has finally arrived, we thought we would put together some top tips for staying safe on the roads during warmer times. When you think of summer, most people probably think of a road trip with their friends, windows downs, cool summer tunes playing, and making memories that will last you a lifetime. So what can you do to help your driving this summer? Firstly, make sure you do your car checks regularly during warmer weather. This will help prevent any problems arising, such as your car overheating if it hasn’t got enough water or coolant. Always check your oil and washer levels too, plus your tyre treads to make sure they still meet legal requirements. If your tyres are under-inflated during hotter temperatures, this will worsen any weak spots or damage that currently exists, making punctures all the more likely. Find out more about what to do if your car breaks down in one of our previous blogs. The sun can be blinding at the best of times, but don’t get caught out when you’re driving. Make sure you have a pair of sunglasses that protect you from the glare of the sun but also still allow you to see safely. If you have to wear glasses then it’s usually a good idea to get prescription sunglasses so you’re not compromising your sight. The sunshield above the windscreen will also help to stop the glare of the sun. Your windows need to be clean both inside and out, as when you drive into the sunlight, especially when it is lower in the sky, it will show up any dirt and marks – which can obstruct your clear view of the road. Spring and summer can signal the start of the hay fever season for many people, and with 27% of UK drivers suffering from it, according to Halfords, it can become hazardous when you drive. According to their study, if you sneeze while driving at 70mph you can lose your vision for up to 100 metres, and one in three hay fever sufferers admitted to it distracting them from driving. 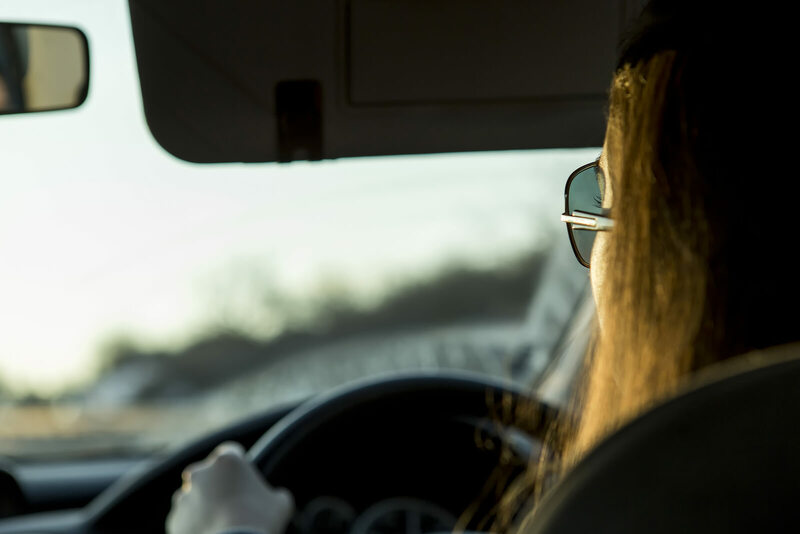 There are a reported two million drivers who are thought to have had a near miss, lost control of their vehicle, or even had an accident as a result of their hay fever. So what can you do to help control it? Always keep a tissue within reach to avoid having to fidget around for one. It’s also a good idea to keep your windows shut and your air vents closed when the pollen levels are particularly high too. There are also many remedies you can buy from pharmacies to help ease your hay fever; just make sure that what you take is non-drowsy, otherwise these can be dangerous when you’re driving. If you are having a particularly bad spell of hay fever, try and put off your journey, or find an alternative mode of transport. Remember that you need to keep hydrated at all times, but especially when the weather is hot. You’re more likely to become dehydrated quicker during the summer months, which can impair your reaction time and concentration. If you’re on a long journey don’t forget to take breaks to rehydrate, stretch your legs, get some fresh air and a coffee if necessary to help stop you from feeling sleepy. Plus, it will give your car a little break too, and allow you to address any concerns with the car in a safe place. If your car has air conditioning, you may find that there are pools of water under your car, which is ok. Most of the time this is caused by condensed water from the car’s air conditioning unit, and isn’t something you need to worry about. You may also find that your engine sounds as though it’s roaring, or sounds louder than usual. This will typically be the cooling fan turning on and off, to help keep the engine cool. This often occurs when you are stuck in traffic, as there is not as much air flowing to the engine, unlike when you’re moving. You may even find that your car feels as though it has less power, almost seeming lethargic. This is perfectly normal for this time of year, and is put down to the warmer air being less dense – which then gives your car’s engine that little less power. Give your car, and yourself, a little bit of TLC and you’ll be set to enjoy the summer months in style.